Who was French Hall named after? Have you ever wonder who French Hall was named after? French held the post of president for two years, resigning in 1866 even before any students had arrived. 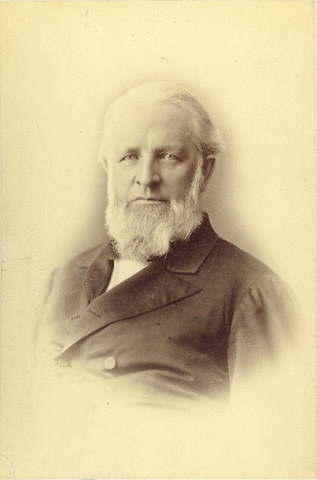 According to Henry Bowker, a student who entered Mass Aggie with the first class in 1867, and remained connected as an alum and trustee for many years, “Judge” French “was a keen, sensitive man, with q good mind, highly trained and well informed, rather distant in manner, but kindly in nature.” Professor French was said to be well ahead of his time in his thinking on agriculture.His short stay as President seems to have been because of an argument with the Board of Trustees (not an uncommon problem for college presidents then and today) over the proposed placement of new buildings. It seems that the original design for the campus was created by the famous architect who designed Central Park in N.Y. City, Frederick Law Olmsted. In 1866 the Trustees of Massachusetts Agricultural College requested that Olmsted, provide recommendations for the grounds of the newly formed institution. This blog is being developed by Dr. John M. Gerber based on investigations into the life and legacy of Professor Levi Stockbridge using historical records. The intent is to compare the Stockbridge legacy to programs and people who are active in the Stockbridge School of Agriculture today.